I always need a vacation after a vacation with my family. Where do this children get all their energy? they just can't get enough of the water. Did a lot of activities around the area. and no one really wants to be in the kitchen. Days of restaurant food gets a little old. I am craving for some filipino dried fish right about now. Yes, dried fish, salty dried fish and dried squid chips with some mango papaya salsa. I was talking to a nice lady I met on vacation about mangoes. it had a texture she didn't like. So I asked if she had bought a red mango. And she did. the reason why I don't use it on my recipes. I always use Atulfo or Champagne Mangoes and Green Mangoes. I used an unripened Green Mango. and still be firm when you push on the skin. and they fall apart when mixed in with other ingredients. is just perfect when paired with fish. If you are pregnant, do not eat Unripe Papaya. Unripe Papaya due to its high latex content, contains pepsins that may cause to induce contractions that will lead to miscarriage. Peel, seed, and dice fruits. If you notice, the papaya in the photo looks like it is ripe, but no it's still unripe. This is the perfect papaya, just a bit soft but still firm, it has both yellow and peach in color. It is not fully ripened yet. A ripened papaya is a darker orange in color. Thanks Ellen. You're lucky to have a Chinatown in Toronto. I always shop there when I'm in town visiting family. I also love the Asian Market Farm Fresh in Scarborough. 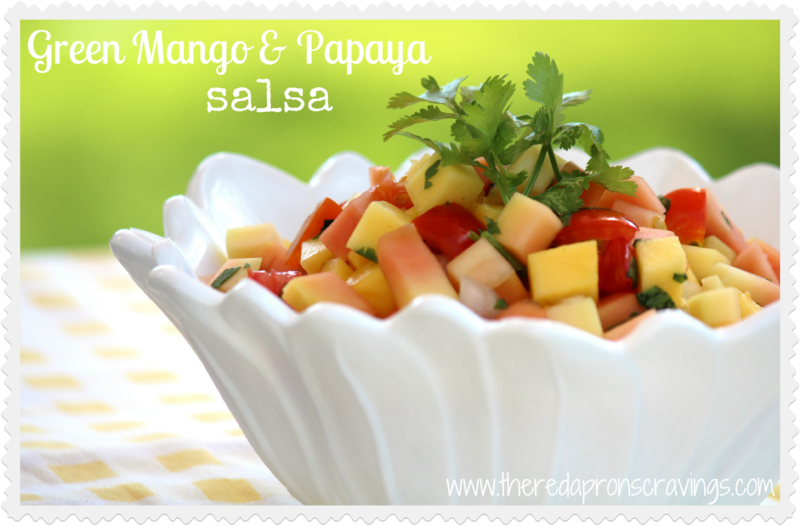 thanks for the recipe for mango/papaya salsa. i made it today w/fried bangus! sarap..
Sarap Delicious! as what my 3 yr. old would say. WOW! So fabulous I love the salsa YUMMY!! Beautiful food, the colours remind me of Bali......recipe will be made!!! thanks! I'm so happy you stop by and joined.